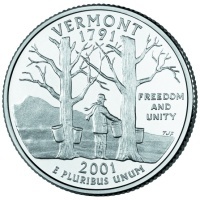 The Vermont State Quarter was the fourth state quarter issued in 2001 and the 14th in the series which was authorized by the 50 States Commemorative Coin Program Act. 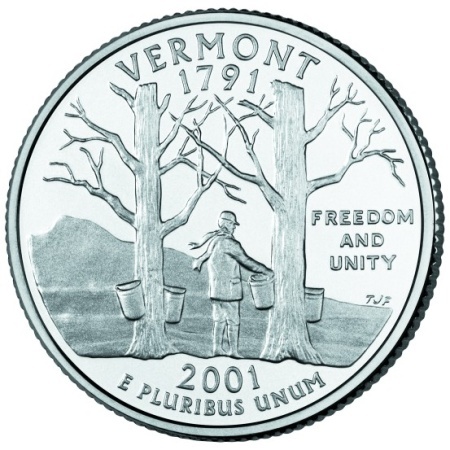 The release date for the VT State Quarter was August 6, 2001. The elements of the design include maple trees collecting sap into buckets hanging from them, with Camel's Hump Mountain in the background, a fitting image for a state famous for its maple syrup and snow skiing. Vermont's Governor Howard Dean appointed the Vermont Arts Council to solicit design ideas from the state's citizens. The Council then narrowed down the design ideas to five concepts, and the Governor's office held an informal radio survey to get the opinions of the citizens of Vermont. All five design ideas included the Camel's Hump Mountain. Governor Dean then selected the final design and submitted it to the Secretary of the Treasury. Below is a table showing the design specifications and mintages of the Vermont State Quarter. Note: The modification moved some of the wording from the reverse to the obverse to leave the reverse available for the state's design. Reverse - Each state theme was proposed, and approved, by the governor of the state. Final design was designed and engraved by T. James Farrell. His initials are just below the words "Freedom and Unity".